Introducing signed limited edition prints with high-resolution color and fine textured paper called giclees! Featuring five different scenes of Annapolis, depicting the nautical to the historic. They have been reproduced as a limited edition (six copies of each scene) fine digital artwork made from inkjet printers. These prints made from original Watercolors by Cynthia Shumaker are a less costly, yet a beautiful alternative for acquiring artwork. The prints are now available for purchase online here or the Historic Annapolis Museum Store. The giclees (12 ½” x 16 ½”, including 1” border) can be purchased at a cost of $200 (shipping and tax not included). 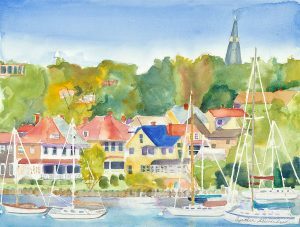 A collection of Annapolis original framed and matted Watercolors of Cynthia Shumaker’s are also available for purchase at the Historic Annapolis Museum Store.